SilverBlade® II - Fast, bonded Internet access from the field, vehicle or office. Fast, bonded Internet access from the field, vehicle or office. Accelerated, resilient and secure access to the Internet and cloud services that is simple to configure and deploy. SilverBlade® II is a compact field unit that bonds and optimises Cellular, Satellite & Wi-Fi Networks. It provides a fast, highly resilient and secure Internet connection for the rapid delivery of live, interactive or file-based media to your Cloud from the latest broadcast cameras, smart phones, and encoders. RazorLink protocols overcome the limitations of using UDP across WANs resulting in more efficient use of network capacity and higher quality video. The RazorLink® protocol has very low overheads and sophisticated error correction resulting in lower latency live streaming. 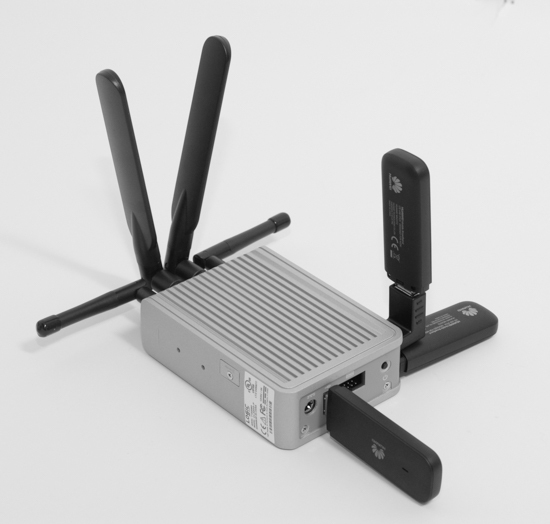 RazorLink® protocols manage the seamless handover between active connections in the event of the loss of one or more connections. Broadcast cameras with built-in encoders can be combined with SilverBlade II to offer a highly cost effective professional live solution, delivering content to the control room or cloud service. Similarly, SilverBlade II can deliver high speed Internet access necessary for 4K 360° cameras to stream to social media and provide higher-quality, more robust interactive content from applications like Skype and Facetime. The RazorLink technology built into Silverblade II accelerates file transfer applications, fully utilising the bandwidth over a single or bonded connection. This is achieved by overcoming the limitations of TCP over poor quality or long distance networks. This works with the built in FTP clients found in some cameras or widely used applications running on laptops and smartphones. SilverBlade II has an internal unlocked 4G modem and is supplied with 3 USB 4G capable modems. A local network (LAN) is provided via built-in WiFi and Ethernet. An auxiliary Ethernet port is available for connection to external WAN services such as DSL or satellite. SilverBlade II requires RazorLink receiver software to be running in a Cloud service or as part of an organisation’s infrastructure. The RazorLink receiver software is available for Windows, OSX and Linux. RazorLink® is Software Defined Networking (SDN) that delivers faster, more robust and secure network connectivity transparently to applications.